At this year’s induction ceremony for the Alpha Omega Alpha medical honor society, 36 new members were welcomed to the Feinberg chapter. 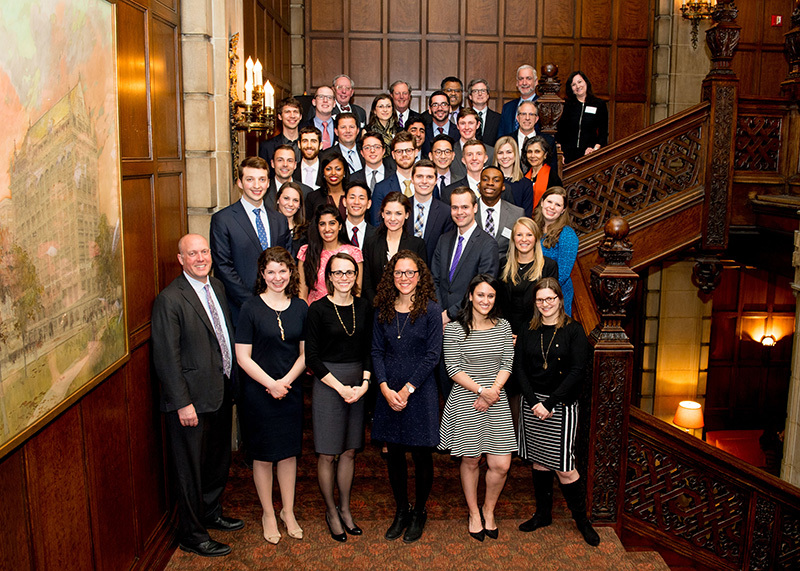 At an induction ceremony on March 14, Northwestern University Feinberg School of Medicine recognized 36 new members of the Alpha Omega Alpha (AOA) medical honor society, which signifies a lasting commitment to scholarship, leadership, professionalism and service. 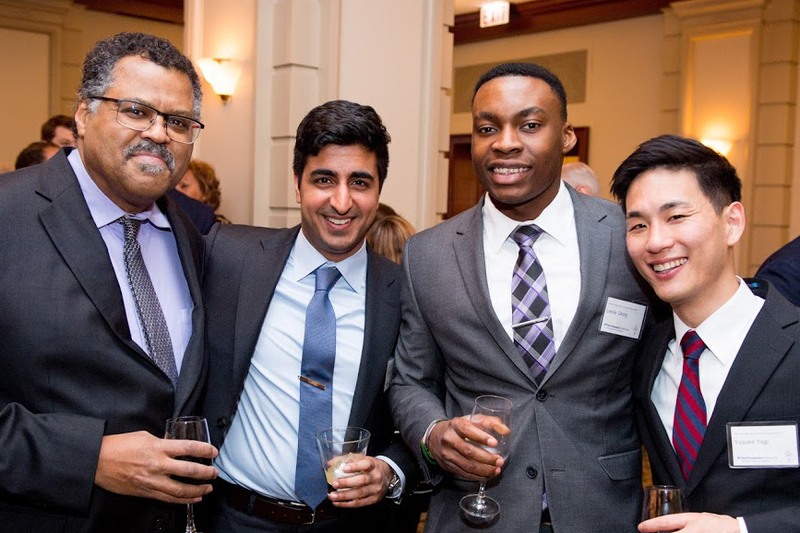 Inductee Leslie Okorji, a fourth-year medical student who is pursuing a residency in general surgery, said he was humbled to be selected and enjoyed getting to know other members of Feinberg’s chapter. “Being a part of AOA will be something that will motivate me in my future career to make myself better. It’s a stepping stone for me to do more as physician, advocate and leader,” Okorji said. 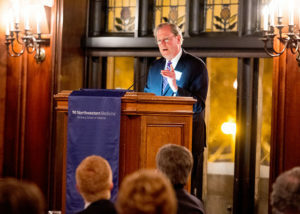 Before the ceremony, John S. Sergent, MD, professor of Medicine at Vanderbilt University School of Medicine, delivered a keynote address, giving an overview of the history of medical education from 1900 to today, and shared highlights from his career and his tenure as director of Vanderbilt’s residency program. 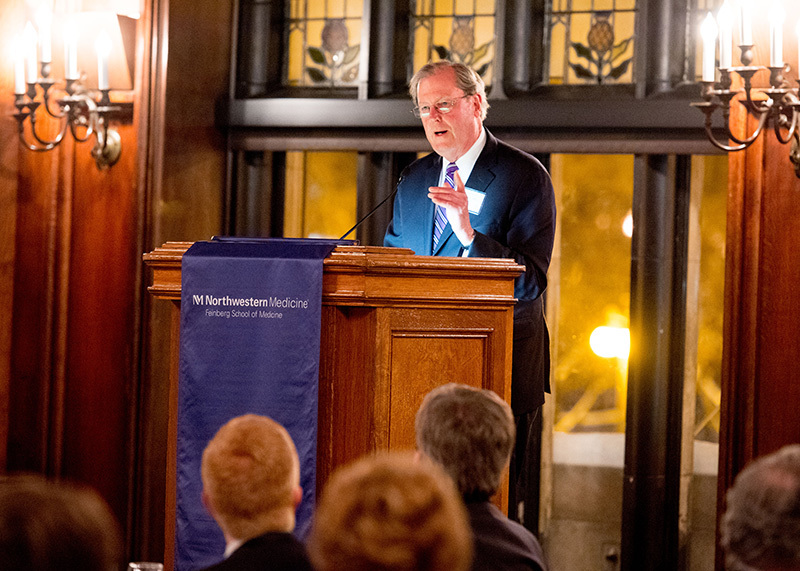 John S. Sergent, MD, professor of Medicine at Vanderbilt University School of Medicine, delivered a keynote lecture, sharing stories from his own residency through his time as a residency program director. Following the lecture, guests attended the induction ceremony, where John Flaherty, MD, councilor of the AOA Illinois Gamma Chapter and professor of Medicine in the Division of Infectious Diseases, thanked faculty and members of the selection committee, congratulated inductees and welcomed family in attendance. Flaherty, who was also awarded for his nine years of service as councilor during the ceremony, shared the motto of AOA, “be worthy to serve the suffering” and reminded the members that with the honor comes a responsibility to professionalism, scholarship, leadership and service. Marianne Green, MD, senior associate dean for Medical Education and Sandra Sanguino, ’93 MD, ’96 ’99 GME, MPH, associate dean for Student Programs and Career Development, welcomed the 24 new medical student members into the society. “I’m excited to be inducted along with a network of brilliant classmates that I hope to stay in touch with,” said Parul Kathuria, a fourth-year medical student who is planning to match in dermatology. Kathuria and Okorji were inducted along with their peers Elizabeth Bleed, Andrew Choi, Michael Colacci, Michael Conrardy, Abram Feldman, Brendan Frainey, Richard Greendyk, Mia Helfrich, Jonathan Hourmozdi, Karolina Kucybala, Molly Lohman, Maximilian Meyer, Neal Moehrle, Christopher Nash, Amanda Rosen, Michael Self, Michael Smith, Alexandra Steverson, Brittany Vieira, Krista Wager, Joseph Weiner and Yusuke Yagi. New housestaff and faculty members of the society were announced by Diane B. Wayne, ’91 MD, vice dean for Education and Dr. John Sherman Appleman Professor of Medicine and Medical Education. They were honored for ongoing leadership in their field, active participation in teaching and community service. (Left to right) AOA inductees John Franklin, MD, MSc, ’14 MA, Jonathan Hourmozdi, Leslie Okorji and Yusuke Yagi attended the induction ceremony. Other resident and fellow inductees included Jill D’Souza, MD, instructor of Otolaryngology – Head and Neck Surgery, Andrew Ketterer, ’13 MD, ’16 MA, chief medical resident in Emergency Medicine, Victoria Sandler, MD, a fellow in the Department of Medicine, Division of Endocrinology, and Kate Swanson, ’13 MD, a resident in Obstetrics and Gynecology. Faculty members welcomed into the honor society included James Carr, MD, professor of Radiology, Medicine and Biomedical Engineering, John Franklin, MD, MSc, ’14 MA, associate dean for Diversity, Inclusion and Student Support and professor of Psychiatry and Behavioral Sciences, Medical Education and Surgery, Joshua Goldstein, MD, associate dean for Graduate Medical Education, associate professor of Pediatrics, Medical Education and Neurology, and Seema Khan, MD, professor of Surgery in the Division of Breast Surgery. Andrew Bunta, ’67 MD, past president of the Medical Alumni Association, announced alumni inductees Joseph DiCara, ‘86 MD, ’89 GME, MPH, assistant professor of Pediatrics, Jeffrey Kopin, ’84 MD, ’88 GME, clinical assistant professor of Medicine in the Division of General Internal Medicine and Geriatrics, and Alisha Thomas, ’05 MD, clinical instructor of Family and Community Medicine.